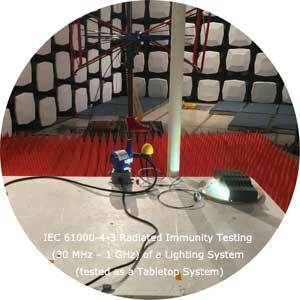 BACL Sunnyvale has a large 5m RF Semi-Anechoic Chamber (with an adjacent fully shielded Control Room) dedicated to IEC 61000-4-3 (and similar) Radiated Immunity Testing. The walls and ceiling of this RF Semi-Anechoic Chamber are lined with Ferrite Tiles that are covered with 4 ft. [1.22] RF Pyramid Absorbers on the walls and ceiling. This Chamber is fitted with a standard 7 ft. high X 4 ft. wide manually-operated single-knife-edge RF shielded personnel and equipment access door, EMI-filtered Lighting, EMI-filtered electrical power for EUTs and Support Equipment, and a remote video monitoring system. The chamber floor has access hatches that allow the passage of cables between the chamber and its Control Room via metal-lined tunnels. The Chamber is equipped with removable ferrite tile panels and “loose laid” 12 inch [30 cm] pyramid RF Absorbers to improve the “quiet zone” performance of the Chamber. This RF Semi-Anechoic Chamber is equipped with all of the required instrumentation (including Signal Generators, RF Power Amplifiers, E-Field Generators and Transmit Antennas, coaxial cables, 3-axis isotropic Field Probes, Directional Couplers, RF Power Meters and RF Power Sensors), as well as the required Instrumentation Control Computers and EMI Test Software to perform Radiated Immunity Testing from 9 kHz to 6 GHz at up to 20 V/m with 80% AM Modulation added. 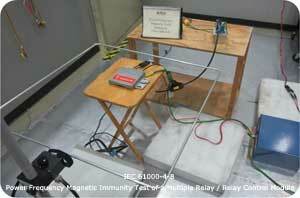 BACL Sunnyvale also has two dedicated EMC Immunity Testing rooms, and in addition, can perform EMC Immunity Testing on its Ground Plane Test Site. All of these instruments listed above have ISO/IEC 17025 –accredited traceable calibrations. 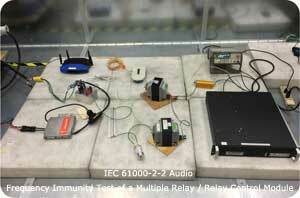 The second of these two Immunity Test Rooms is equipped with a large, directly earthed Reference Ground Plane and an IEC 61000-4-2-compliant ESD Test Bench (and the required ESD Test Horizontal and Vertical Coupling Planes). 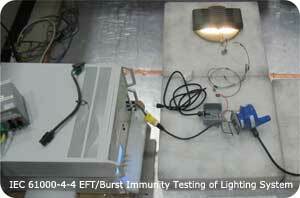 BACL Sunnyvale performs ESD Immunity Tests using a TESEQ NSG 438 ESD Generator that is equipped with four different ESD Discharge Networks (i.e., the 150 pF/ 330 Ohm, 330 pF / 330 Ohm, 150 pF / 2000 Ohm, and the 330 pF /2000 Ohm Discharge Networks) that allow testing to the requirements of IEC 61000-4-2 and ISO 10605. 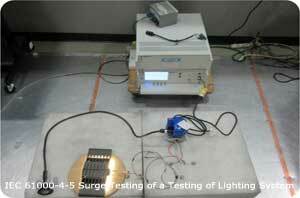 This allows BACL to perform ESD tests on automotive products as well as on products intended for use in home, office, commercial, industrial, and ship-board applications. All of these instruments listed above have ISO/IEC 17025 –accredited traceable calibrations. Additionally, this room contains BACL’s Haefely AXOS5 Compact Immunity Test System (inclusive of the Haefely DIP 116 External Transformer Unit). 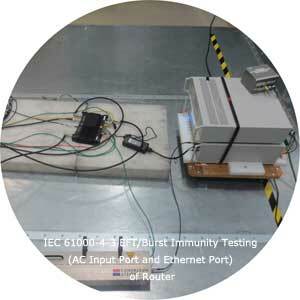 This self-contained “two box” System provides a comprehensive Single-phase AC and DC Immunity Test Capability that includes a single-phase (and DC) Coupling/Decoupling Network and a set of Impulse Generator Modules that provide IEC 61000-4-5 (and similar) Combination Wave Surge Immunity Tests, IEC 61000-4-4 (and similar) Electrical Fast Transient/Burst Immunity Tests, and, IEC 61000-4-11 Voltage Dips and Short Interruptions Tests. 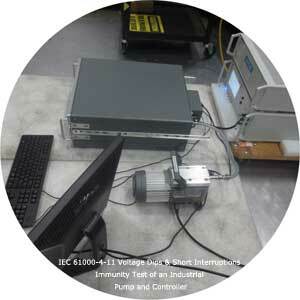 BACL’s Haefely AXOS5 Compact Immunity Test System can be quickly be connected to BACL’s Haefely Model FP-EFT100M2 3-Phase, 4 wire, 100 A/Phase EFT/Burst Coupling/ Decoupling Network or to BACL’s Haefely Model FP-SURGE100M2 3-Phase, 4 wire, 100 A/Phase Surge Coupling/Decoupling Network whenever either 3-Phase AC or (high current) DC test capability is required. All of these instruments listed above have ISO/IEC 17025 –accredited traceable calibrations. 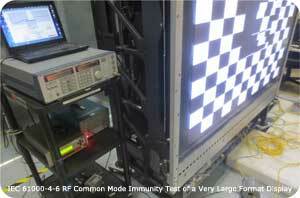 BACL Sunnyvale can also use its large, dedicated Ground Plane Test Site (GPTS) as an EMC Immunity test site for performing both Power frequency Magnetic Immunity Tests (per IEC 61000-4-8 and similar Standards), and, RF Common Mode Immunity Tests (per IEC 61000-4-6 and similar Standards). 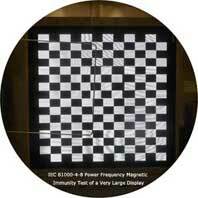 The BACL Sunnyvale GPTS is described in detail on the EMC Emissions Test webpage; for EMC Immunity Test purposes, the BACL Sunnyvale GPTS provides a 12 ft. [3.66 m] wide X 10 ft. long Ground Plane for testing large products. 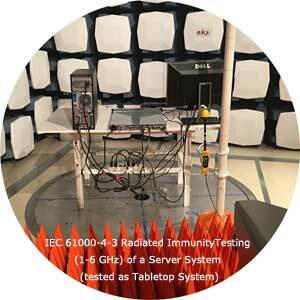 BACL Sunnyvale has all of the required test instrumentation, and test software needed to perform the IEC 61000-4-6 (and similar) RF Common Mode Immunity Tests and IEC 61000-4-8 (and similar) Power-frequency Magnetic Immunity Tests. 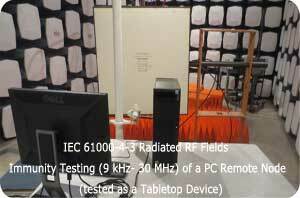 BACL Sunnyvale’s IEC 61000-4-6 test instrumentation includes RF Signal Generators, RF Power Amplifiers, Impedance Matching Attenuators, Directional Couplers, RF Power Meters and Power Sensors, a complete suite of M-Series Coupling / Decoupling Networks [CDNs] (including an M-1, two M-2’s, two M-3’s, an M-4, and an M5), Telecom Line CDNs, an EM- Clamp, and a high-current-rated Bulk Current Injection Probe, Calibration Jigs, and Instrument Control Computers. 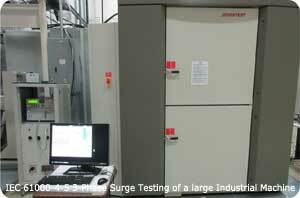 BACL Sunnyvale’s IEC 61000-4-8 test instrumentation includes a high-power Precision AC Source, a Rectangular Induction Coil, a current transformer, and a Hall-effect Clamp-on Current Meter. All of these instruments listed above have ISO/IEC 17025 –accredited traceable calibrations.